According to the latest research, an average smartphone user spends approximately 2 hours, 51 minutes on their phone while mobile apps take more than 92% of that time. And why wouldn’t they? Till date, the Google Play Store of Android has over 3.5 million apps in its database which is utilized by the users for various purposes including communication, entertainment, task management, e-commerce, and much more. The Android app platform is a popular choice amongst aspiring app developers. Why? It is because Android dominates all the other operating systems’ market share by holding 85.9% of the market’s worth. Additionally, many companies including Samsung, Nokia, and LG make Android devices, and it’s also (usually) budget-friendly than its opponents. Apart from being affordable, Android users prefer using the operating system for its easy usability, Google integration, and most importantly – the unlimited number of games and apps. Given the many benefits, it doesn’t come as a surprise that app developers initially start off with ‎Android as their prime choice for development. ‎However, how does one start off with Android without any prior experience? Yes, you do need a killer idea but in the vast industry – merely having a great idea doesn’t work! As a beginner, you may be overwhelmed with the technical aspects of app development. On the other hand, you may be itching to launch your app and start getting your first download, reviews, and profits. To make the process simple, we have compiled an easy-to-follow guide for beginners that will assist you in starting your first app without any hurdles. An IDE (Integrated Development Environment) is required to program your app in different languages. Although there are several IDE platforms available – Android Studio from Google is highly recommended. To download the IDE, click here! Android Studio is easy to use and gives the programmers a central interface to enter the codes. The best feature about the IDE is that it comes ready with other components that are essential for software development including Android SDK (software development kit exclusively for Android) and the Android Virtual Device – an emulator that allows testing of software before the launch. Apart from an IDE, make sure you have a Java Development Kit (JDK) installed. The JDK is a vital add-on as it enables the Android Studio to interpret and compile codes for the development process. Once you have the basics installed on your computer, go ahead and launch the software. The package will be the one that people will see when your app eventually launches into the Android store so make sure you choose a legitimate name. Most importantly, avoid using funny names for the title of your app. Besides the name of the app, the main page will ask the developer to choose the device type for which the app they are creating. Initially, we recommend opting for the Phone and Tablet device. However, TV, glass, and wearable option are also available for expert developers. Moreover, the IDE will also ask you to choose the “minimum SDK” for the new app. Here, you have to make sure that you select the lowest version of Android as not everyone has updated their devices to the latest one. This way you can support phones that are still running older versions and reach a broader audience. Apart from these aspects, the main page will also ask for your backup options. Make sure you don’t skip this step as it’s always a good idea to keep a saved copy of your codes and other online work. 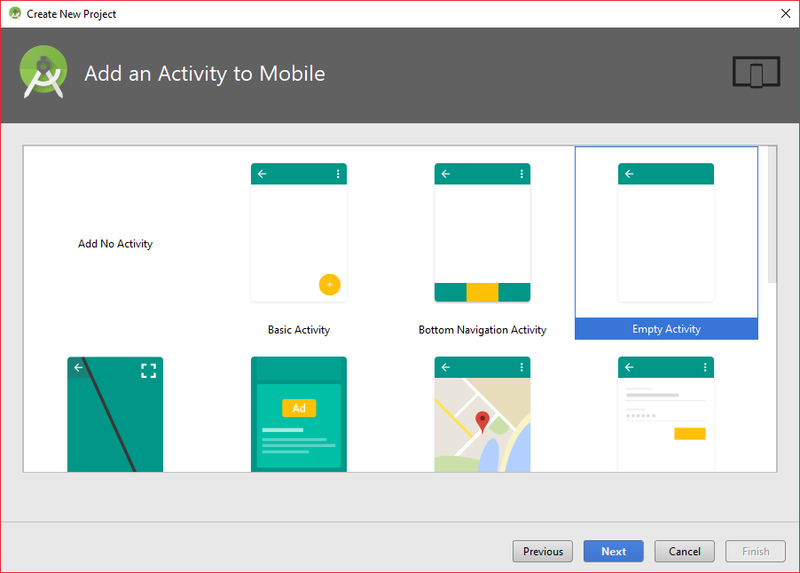 On the next page, you will see an activity module option. Here you can choose the way your app looks in the beginning. Since you are a novice developer, it is best to select the most uncomplicated design. 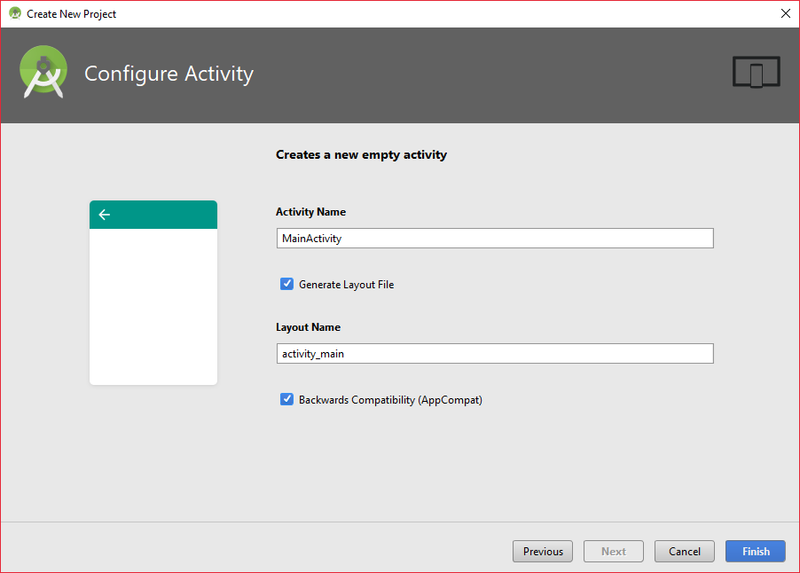 Now, enter the name of the activity and determine the layout of your page. The layout, as most readers are aware, is a separate code and is used to analyze where the images and menus go. It is also used to determine the font and its size as well as color. When the app opens, you should see an image of a phone saying “Hello world” in the center along with a directory tree on the left side. The directory tree contains all the files and folders related to the app. Here you will notice an open tab with the ‘activity_main.XML’ showing on display. Another XML file with the name of ‘content_main.xml’ will also be open if you choose basic activity during project setup. Anything that you want to edit is on the ‘content_main.XML’ page so go ahead and open it for now. In case the page is not open in the beginning, just use the directory tree on the left and open the XML by choosing app > res > content_main.xml. There is also an option to change the widgets on the central dashboard. For example, you can replace the “Hello world” widget with Hello or something other. You can also change the colors and the fonts of the texts according to your preference. Now open the “mainactivity.java. The customization of this code will define your app behavior. If the tab doesn’t open up automatically, find it under App > Java. Anything that you write after ‘void button on click’ will be the action performed by the user upon clicking on the button. Here you will also see an “import” tab at the top. Click that to see a line import android.widget.Button. Now go back to the content_main.xml and click on it. In the right corner, you will see the option for ‘onClick’ Click on this and select the line of code you wrote before. 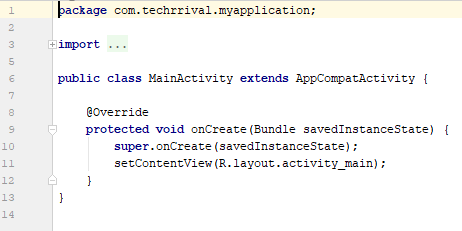 This process will tell Android Studio that you want to associate the section of code with the button you created. Now you are all set to launch your app. However, remember to run the emulator that tests your app for bugs and glitches. As we are all aware, the customers of today have no tolerance for spam apps and prefer official apps like AirG. Running a test before launch will ensure that your app runs according to the demands of industry and your consumer. The world of software development is rapidly changing, and for a novice developer, it’s essential to stay updated with the current trends and adapt to changes. Moreover, the steps above may seem intimidating to read, but when you start the work, we assure you that the process will not be as complicated. Be consistent and seek help from YouTube tutorials if you are stuck. Good luck!